Ignore this translation. This one is the new (and hopefully) better one. I truly love this pairing. And even if this picture is not the most fitting for this arrangement, I still think it’s the best one for depicting the essence of the song. This, and I wanted to put something somehow yuri. At the beginning, after C80, I thought this arrangement was more Mima’s dedicated than anything else. But I was wrong. Completely wrong. 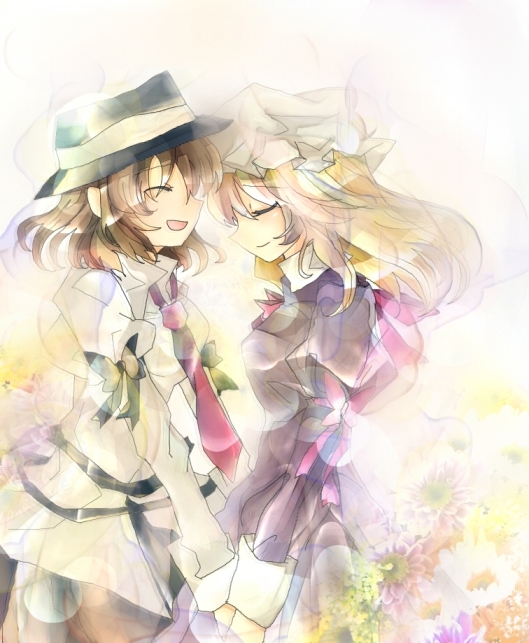 No matter how I look at it, now I found out this is a theme entirely based on Maribel and Renko. The world is just more beautiful after this. Well, it’s not the first time I say something like: I won’t write a lot as introduction. No wait. I’ll end it here; and explaining my interpretation. What I think about this song, is a mix of sadness and happiness. I want to stated first that I think yukina (the first vocalist) speaks as Maribel, while Mie as Renko. I’ve read this as a huge dream which isn’t a dream. To explain this better: Mary and Renko met in a dream, a dream so real they can’t forget (plus, keep in your mind Maribel’s ability). Therefore, they want to meet each other again, and so they don’t give up in searching a way to fulfill their wish. In the end, they discover what they want it’s something impossible to realize, a dream’s a dream afterall; but even if, they’re aware that, if they strongly desire it, they can meet each other when they sleep. Moreover, I have contrast feelings here too. I don’t know if the ending’s happy or sad. I found awfully cute and heart-warming this “No matter what, I’ll meet you again” feeling, while I found awfully heart-breaking the “After all, this is not reality” part. But well, I love this twisted emotions, so for me it’s fine…maybe. Another possible interpretation which popped up in my mind, is that Mary meets Yukari in dreams, and not Renko (this would actually explain better things, since it’s supposed Mary and Renko already know each other), but since I support the MaryRenko pairing, I’ll stick with the first interpretation, and saying: Renko and Mary still haven’t met in “reality”. You can either agree or not, I’m writing this simple because in this way maybe you’ll understand better my choice of translation. Well, time for the notes. 「現夢」, translittered as “genmu” in the title’s track, means “Present Dream”. But 「現夢」, translittered as “utsutsu no yume”, as the PV says (this PV), means “The Reality of Dreams”. The contrast between the meanings of the kanjis alone is already enough to makes me say, this is awesome. But that’s not all. If you change the position of the kanjis, surprise! It becomes 「夢現」, “yume utsutsu”, which could be mean both “Half asleep and half awake”, or “Dream and Reality”. And if you don’t change their position, and keep 「現夢」 translittered as “utsutsu yume”, its translation’s “Reality and Dream”. Both a clear reference to 「夢と現の境界」, Border between Dream and Reality. “君と出会い　夢を視てた | I saw in a dream the meeting with you”; somehow I think this sounds a lot odd; better, I’m sure about it. On a normal doujin or visual novel, I’d probably translated it as “I saw our meeting in a dream” or “I met you in a dream”. But this isn’t a doujin, nor a visual novel. Since the japanese text evince the “meet with you” part, I decided to keep it along the translation, even if it ended up to be stiff. “忘れることなんてできない | I still remember it”; the funny thing is that I translated this phrase in two completely different ways along the whole song. Peace to everyone. I’ll repeat the literal translation all over the place because I want to. Anyway. Here I translated it as “I still remember it” because I find it more fitting considering the context. Since I interpreted this dream as a good one, typing something similar to the literal translation would’ve ended to be as a “I want to forget it, but I can’t”. And since to me the speaker -Mary- wants to reach the other person -Renko-, I decided to translate in that way. Literal, the translation is “The thing I’m not able to forget”. “僕は　夢を視続ける　醒めない夢を | I continue to see it; don’t wake up from this dream”; aside the fact that “dream” in the japanese text is repeated four times in two lines and I didn’t keep them, I wanted to focus your attention on the second part of the phrase. Because, what I translated as “Don’t wake up from this dream” can be translated also as “Don’t be aware this is a dream”. Basically, it could also be interpretated as a “Don’t realize this is a dream, because if you do that, you’ll wake up”. “箱庭が隠すのは | It’s what the Miniature Garden hides”; this is the phrase I had more problems with. This and the stanza below. I haven’t read Perfect Memento in Strict Sense, nor Bohemian Archive in Japanese Red, and I know very a little about Changeability of Dream and Reality, so I have no idea if there’s a Miniature Garden, or something who can be considered like. My bet is that this “Miniature Garden” is Gensokyou itself, or at least is the place where Mary and Renko meet. Anyway, a more fluent translation of the whole phrase (assuming I haven’t misunderstanding it) it’s “The Miniature Garden hides the exit I don’t find”. Somehow I believe that considering the subordinate clause as part of the next phrase is the right choice, but here I couldn’t find a good translation following that way, so I considered it as “inverted” sentences. “小さな灯し火 | A faint light / 小さな思い出 | Faint memories”; in both of them, the adjective used is “small”, not “faint”. I prefered translated this as “faint” because I think it suits more both “light” and “memories” than “small”. “箱庭を壊すのは | It’s what destroys the Miniature Garden”; same as the previous note, if I haven’t misunderstanding this phrase, a more fluent translation would be ” I believe only that which destroys the Miniature Garden”. “忘れることなんてできない | How can I forget […] ?”; literal, this means “I’m not/won’t be able to forget […]”. But as stated above, I consider this as a good dream, and the literal translation ended up to sound as a “bad dream I can’t forget”. “たぐり寄せていた　虚ろな日常 | Step by step, I was approaching an empty, ordinary life”; the “step by step” part in japanese is written as “transport by passing from hand-in-hand”, but I’ve read it used also as a “climbing something little by little”, and also as an “auxiliary”. In the end, I decided to translated in this way because it sounds better, and personally I know no more meanings of that expression. The “empty, ordinary life” part is actually a pretty liberal translation, since the japanese text says “blank everyday”. I’m not sure how to explain this -besided, I watched Nichijou. Hope you get the meaning anyway. “閉じた瞳を開けば | If I open the eyes I closed”; awesome construction is awesome. Actually, I tried my best to put “eyes” as the object of both the verbs, since in the japanese text it’s in this way. “この奇跡を | How can I forget that dream?”; here what in the song is spelled as “dream”, in the text is written as “miracle”. If I had to follow the lyrics only, I’d translated it as “How can I forget that miracle?”. Just to say, is because of this that I decided to read the entire song (dream) in a good way. “過去も　現在も　未来も | Also the past, the present, and the future”; the song actually says “Yesterday, now and tomorrow too”. For once in a while, I kept the lyrics part, instead of the spelled part, because is more epic. “醒めない幻想と | I won’t wake up from this dream”; while before “dream” was written as “miracle”, here’s written as “illusion”. You can read this also as “I won’t wake up from this illusion” where -I’d say of course- “illusion” shares the first two kanjis of Gensoukyo. “君の声は届いているから | Your voice will still reaching me”; I’ve change a lot this phrase -actually the whole stanza- because I wanted to translated it with chained phrases (because the phrases are actually chained). I pretty much fucked all the conditionals, but hey, keep writing “If I do this, this will happen” is just a no. Anyway; the “true” translation of this phrase is “Your voice is reaching me”. Day after day, I still remember it. I continue to see it; don’t wake up from this dream. I don’t find the exit; it’s what the Miniature Garden hides. My resignation locks it, a faint light. I believe only that; faint memories. How can I forget that night? I already know it’s transient, what I repeatedly wish. Step by step, I was approaching the emptiness. But to desire it eagerly only one more time, it’s fine. I can’t look away; I stared at it, as usual. How can I forget that place? If I open the eyes I closed, will I keep dreaming that world? I’m scared to lose it; I’ll just continue to sleep. Now, there’s a faintly, far away voice. How can I forget this dream? ~ by Jaefine on February 28, 2012.